Editorial Board, Associate Professor of Public International Law, Grotius Centre for International Legal Studies, Leiden University. I am grateful to Sergey Vasiliev, Jens Iverson, Eric De Brabandere, and Ingo Venzke for their valuable insights and comments. 1 S. Zweig, The World of Yesterday: Memoirs of a European (2009), at 3. 2 For some background, see Robinson, D., ‘A Cosmopolitan Liberal Account of International Criminal Law’, (2013) 26 LJIL 127; Sander, B., ‘International Criminal Justice as Progress: From Faith to Critique’, in Bergsmo, M. et al. (eds. ), Historical Origins of International Criminal Law: Volume 4 (2015), 749; Simpson, G., ‘The Conscience of Civilization and Its Discontents: A Counter-history of International Criminal Law’, in Kastner, P. (ed. ), International Criminal Law in Context (2017), 9. 3 See Tallgren, I., ‘The Sensibility and Sense of International Criminal Law’, (2002) 13 EJIL 561; Luban, D., ‘After the Honeymoon: Reflections on the Current State of International Criminal Justice’, (2013) 11 JICJ 505; Simpson, G., ‘Linear Law: The History of International Criminal Law’, in Schwöbel, C. (ed. ), Critical Approaches to International Criminal Law (2014), 159; Rabkin, J., ‘Global Criminal Justice: An Idea Whose Time has Passed’, (2005) 38 CILJ 753. 4 The editorial contributions of my colleagues in the International Criminal Courts and Tribunals section of LJIL have reflected on this necessary evolution in international criminal scholarship. See Stahn, C., ‘Between “Faith” and “Facts”: By What Standards Should We Assess International Criminal Justice?’, (2012) 25 LJIL 251; Jacobs, D., ‘Sitting on the Wall, Looking In: Some Reflections on the Critique of International Criminal Law’, (2015) 28 LJIL 1; Vasiliev, S., ‘On Trajectories and Destinations of International Criminal Law Scholarship’, (2015) 28 LJIL 701; van Sliedregt, E., ‘International Criminal Law: Over-Studied and Underachieving?’, (2016) 29 LJIL 1. 5 Mégret, F., ‘The Anxieties of International Criminal Justice’, (2016) 29 LJIL 197, at 197. 6 See, for example, Robinson, D., ‘Inescapable Dyads: Why the International Criminal Court Cannot Win’, (2016) 29 LJIL 323. 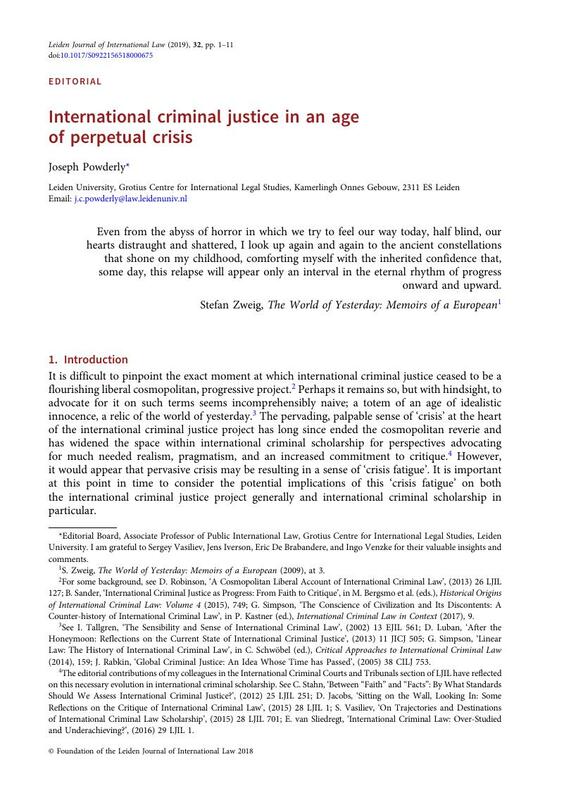 7 S. Vasiliev, ‘The Crises and Critiques of International Criminal Justice’, Draft Paper, ICC Scholars Forum 2018, The Hague, 15–16 June 2018. Copy on file with author. 8 See, for example, Robinson, D., ‘The Identity Crisis of International Criminal Law’, (2008) 21 LJIL 925; see Robinson, supra note 7; ‘A Cosmopolitan Liberal Account of International Criminal Law’, (2013) 26 LJIL 127; see also Mégret, supra note 6. 9 See Mégret, supra note 6, at 218. 12 See M. Helal, ‘The Crisis of World Order and the Missing Voice of International Law’, OpinioJuris, 14 September 2018, available at opiniojuris.org/2018/09/14/the-crisis-of-world-order-and-the-missing-voice-of-international-law/; M. Helal, ‘The Crisis of World Order and the Constitutive Regime of the International System’, (forthcoming 2019) 46 Florida State University Law Review, Ohio State Public Law and Legal Theory Working Paper Series No. 459, available at papers.ssrn.com/sol3/papers.cfm?abstract_id=3247645; Mishra, P., ‘The Globalization of Rage: Why Today’s Extremism Looks Familiar’, (2017) 95 Foreign Affairs 46; E. Luce, The Retreat of Western Liberalism (2017); H. Kissinger, World Order (2014). 13 See, for example, the recent seminar, ‘International Law in a Dark Time’, organized by the Erik Castrén Institute of International Law and Human Rights and Peking University Institute of International Law Collaboration Project, available at blogs.eui.eu/constitutionalism-politics-working-group/cfp-seminar-doctoral-students-junior-researchers-international-law-dark-time/; 2016 ESIL Annual Conference, ‘How International Law Works in Times of Crisis’, Riga, 8–10 September 2016, available at esil-sedi.eu/?p=1060&lang=fr; ESIL Research Forum, ‘International Law in Times of Disorder and Contestation’, Jerusalem, 28 February–1 March 2018, available at esil-sedi.eu/?p=3592&lang=fr; van Genugten, W. and Bulterman, M., ‘Crises: Concern and Fuel for International Law and International Lawyers’, (2012) 44 NYIL 3. 14 See Amsterdam Centre for International Law, ‘Contingency in the Course of International Law’, 14–16 June 2018, University of Amsterdam, available at acil.uva.nl/content/events/workshops/2018/06/contingency-in-the-course-of-international-law-how-international-law-could-have-been.html. See also Venzke, I., ‘What If? Counterfactual (Hi)Stories of International Law’, (2018) 8 Asian Journal of International Law 403. 15 In the specific context of international criminal law, see Krever, T., ‘International Criminal Law: An Ideology Critique’, (2013) 26 LJIL 701. 16 Charlesworth, H., ‘International Law: A Discipline of Crisis’, (2002) 65 Mod.L.Rev. 377. See also B. Authers and H. Charlesworth, ‘International Human Rights Law and the Language of Violence’ (2013) Regnet Research Paper No. 2013/18, available at papers.ssrn.com/sol3/papers.cfm?abstract_id=2364212. 17 H. Charlesworth, supra note 17, at 377. 18 Bikundo, E., ‘Saving Humanity from Hell: International Criminal Law and Permanent Crisis’, (2013) 44 NYIL 89. 19 See Koselleck, R., ‘Crisis’, (2006) 67 Journal of the History of Ideas 357. 20 G. Bass, Stay the Hand of Vengeance (2002), at 203. 21 Mutua, M., ‘Never Again: Questioning the Yugoslav and Rwanda Tribunals’, (1997) Temple International and Comparative Law Journal 167. 22 Mégret, F., ‘Justice in Times of Violence’, (2003) 14 EJIL 327, at 334: referring to international criminal law as a ‘palliative to sovereign failure’. 23 Koller, D., ‘The Faith of the International Criminal Lawyer’, (2008) 40 N.Y.U.J.Int’l Law & Pol. 1019. 24 UN Secretary General, ‘Establishing International Criminal Court will be fitting way to inaugurate new millennium’, Press Release, UN. Doc. SG/SM/6895, 16 February 1999, available at www.un.org/press/en/1999/19990216.sgsm6895.html. 25 Speech of the President of the Assembly of States Parties, Mr Sidiki Kaba, 15th session of the Assembly of States Parties, 16 November 2016, available at asp.icc-cpi.int/iccdocs/asp_docs/ASP15/ASP15-Opening-Statement-PASP-ENG.pdf. 26 See Damaška, M., ‘What is the Point of International Criminal Justice?’, (2008) 83 Chi-Kent L.Rev. 329. 27 H. Charlesworth, supra note 17, at 388. 28 See Vasiliev, S., ‘Between International Criminal Justice and Injustice: Theorising Legitimacy’, in Hayashi, N. and Bailliet, C.M. (eds. ), The Legitimacy of International Criminal Tribunals (2017), at 66. See generally Hayashi and Bailliet, ibid. 29 See Vasiliev, supra note 8. 30 Ibid., Vasiliev identifies two notable exceptions in this regard: Sirleaf, M.V.S., ‘Regionalism, Regime Complexes and the Crisis in International Criminal Justice’, (2016) 54 Colum.J.Transnat’l.L. 699; and Kendall, S., ‘Critical Orientations: A Critique of International Criminal Court Practice’, in Schwöbel, C. (ed. ), Critical Approaches to International Criminal Law (2014). 31 Kennedy, D., ‘When Renewal Repeats: Thinking Against the Box’, (2000) 32 N.Y.U.J.Int’l Law & Pol. 335, at 407. A similar argument is made by Charlesworth, supra note 17, at 391. 32 For example: ‘As far as America is concerned, the ICC has no jurisdiction, no legitimacy, and no authority. The ICC claims near-universal jurisdiction over the citizens of every country, violating all principles of justice, fairness, and due process. We will never surrender America’s sovereignty to an unelected, unaccountable, global bureaucracy’, H.E. Donald Trump, ‘Address by the President of the United States of America’, 73rd Session of the United States General Assembly Annual General Debate, New York, 25 September 2018, available at gadebate.un.org/sites/default/files/gastatements/73/us_en.pdf. ‘We will not cooperate with the ICC. We will provide no assistance to the ICC. We will not join the ICC … We will let the ICC die on its own. After all, for all intents and purposes, the ICC is already dead to us’, J. Bolton, ‘Speech to the Federalist Society’, Al Jazeera, 10 September 2018, available at www.aljazeera.com/news/2018/09/full-text-john-bolton-speech-federalist-society-180910172828633.html. 33 While there have been frequent cries of ‘crisis’ from the both the Court’s supporters and detractors, little attention has been given to contemplating the geopolitical fallout should the Court ever actually succumb to crises. 34 See van Sliedregt, supra note 5, at 5. 35 Burgis-Kasthala, M., ‘Scholarship as Dialogue? TWAIL and the Politics of Methodology’, (2016) 14 JICJ 921; Mégret, F., ‘What Sort of Global Justice is “International Criminal Justice”?’, (2015) 13 JICJ 77. 36 See Burgis-Kasthala, supra note 36, at 927. 37 Ibid., at 929. Burgis-Kasthala does note a number of exceptions in this regard, namely: Smeulers, A. et al., ‘The Selection of Situations by the ICC: An Empirically Based Evaluation of the OTP’s Performance’, (2015) 15 Int.C.L.R. 1; and Sadat, L., ‘Crimes Against Humanity in the Modern Age’, (2013) 107 AJIL 334. 39 See Stahn, supra note 5, at 254. 40 Ibid., at 257. See also van Sliedregt, supra note 5, at 8: ‘ICL, in pursuing original scholarship and advancing the field as a whole, can draw on and take inspiration from legal realism’. 41 See generally K. Clarke, A. Knotterus and E. De Volder, Africa and the ICC: Perceptions of Justice (2016); C. Jalloh and I. Bantekas, The International Criminal Court and Africa (2017). 42 For an overview see M. Ssenyonjo, ‘State Withdrawals from the Rome Statute of the International Criminal Court: South Africa, Burundi and The Gambia’, in Jalloh and Bantekas, ibid., at 214. 43 See the AU ‘Withdrawal Strategy Document’, available at www.hrw.org/sites/default/files/supporting_resources/icc_withdrawal_strategy_jan._2017.pdf. 44 See S. O’Grady, ‘Gambia: The ICC Should be Called the International Caucasian Court’, Foreign Policy, 26 October 2016. 46 Particularly in the context of the Al Bashir case and the ongoing issue of the relationship between the Rome Statute and the applicability of head of state immunity. See Prosecutor v. Omar Hassan Ahmad Al Bashir, Revised Order on the Conduct of the Hearing Before the Appeals Chamber in the Jordan Referral re Al-Bashir Appeal, Case No. ICC-02/05-01/09 OA2, 30 August 2018; Media Advisory, ‘Al Bashir Case: ICC Appeals Chamber Hearing Submission on Legal Matters Raised by Jordan from 10-14 September’, ICC, available at www.icc-cpi.int/Pages/item.aspx?name=ma232. 47 For a small selection of this burgeoning field see, for example, Clarke, Knotterus and De Volder, supra note 42; Nouwen, S. and Werner, W., ‘Doing Justice to the Political: The International Criminal Court in Uganda and Sudan’, (2010) 21 EJIL 942; Tiemessen, A., ‘The International Criminal Court and the Politics of Prosecutions’, (2014) 18 IJHR 444; W. Kaleck, Double Standards: International Criminal Law and the West (2015); Kiyani, A., ‘Group-Based Differentiation and Local Repression: The Custom and Curse of Selectivity’, (2016) 14 JICJ 939; Krever, supra note 16; Schwöbel, C. (ed. ), Critical Approaches to International Criminal Law (2014). 48 See, for example, Nouwen, S., ‘“As You Set Out for Ithaka”: Practical, Epistemological, Ethical, and Existential’, (2014) 27 LJIL 227; Kendall, S. and Nouwen, S., ‘Representational Practices at the International Criminal Court: The Gap Between Juridified and Abstract Victimhood’, (2013) 76 Law and Contemporary Problems 235; K. Clarke, Fictions of Justice: The International Criminal Court and the Challenge of Legal Pluralism in Sub-Saharan Africa (2009). 49 See generally the symposium entitled, ‘Third World Approaches to International Criminal Law’ in (2016) 14 JICJ at 915–1030. Earlier outliers of TWAIL scholarship on international criminal law include: Anghie, A. and Chimni, B.S., ‘Third World Approaches to International Law and Individual Responsibility’, (2003) 2 Chinese Journal of International Law 77; Jalloh, C., ‘Regionalizing International Criminal Law?’, (2009) 9 Intl.C.L.R. 445; and Okafor, O.C. and Ngwaba, U., ‘The International Criminal Court as a “Transitional Justice” Mechanism in Africa: Some Critical Reflections’, (2015) 9 International Journal of Transitional Justice 90. 50 Kiyani, A., Reynolds, J. and Xavier, S., ‘Foreword: Third World Approaches to International Criminal Law’, (2016) 14 JICJ 915, at 917–18. 52 Madsen, M., Cebulak, P. and Wiebusch, M., ‘Backlash Against International Courts: Explaining the Forms and Patterns of Resistence of International Courts’, (2018) 14 International Journal of Law in Context 197. 54 See Trump, supra note 33. 55 See, Crawford, J., ‘The Current Political Discourse Concerning International Law’, (2018) 81 Mod.L.Rev. 1. 56 Defined by Henry Lovat as, ‘intense and sustained government disapproval of tribunal conduct, accompanied by aggressive steps to resist such conduct and to remove its legal force’. See Lovat, H., ‘International Criminal Tribunal Backlash’, in Heller, K. et al. (eds. ), Oxford Handbook of International Criminal Law (forthcoming 2019), available at papers.ssrn.com/sol3/papers.cfm?abstract_id=3253050. See also contributions to ‘Resistence to International Courts – Special Issue’, (2018) 14 International Journal of Law in Context, at 193–313. 57 Madsen, Cebulak and Wiebusch, supra note 53, at 197, 199. See also Caron, D. and Shirlow, E., ‘Dissecting Backlash: The Unarticulated Causes of Backlash and Its Unintended Consequences’, in Follesdal, A. and Ulfstein, G. (eds. ), The Judicialization of International Law: A Mixed Blessing? (2018), 159; Alter, K., Gathii, J. and Helfer, L., ‘Backlash Against International Courts in West, East and Southern Africa: Causes and Consequences’, (2016) 27 EJIL 293; Madsen, Cebulak and Wiebusch, supra note 53. 58 Madsen, Cebulak and Wiebusch, supra note 53, at 199. 60 See Vasiliev, supra note 8, at 8. 62 See Charlesworth, supra note 17, at 387. 63 Similar sentiments are expressed by Vasiliev, supra note 8, at 13. 64 More sceptically, it might also be viewed as a tactic of ‘deliberate circumvention, muting, and exclusion’. I am grateful to Sergey Vasiliev for this insight. See Vasiliev, supra note 8, at 13. For an account of crisis as distraction, see Authers, B. and Charlesworth, H., ‘The Crisis and the Quotidian in International Human Rights Law’, (2013) 44 NYIL 20, at 28–30. 65 ‘Symposium: The Intention of the Drafters – the ICC at 20’, (2018) 16 JICJ at 230–402. 66 ‘Special Issue: The Rome Statute at Twenty – Enhancing Efficiency and Effectiveness at the International Criminal Court’, (2018) 3 Intl.C.L.R. at 377–575. 67 ‘Symposium on the Rome Statute at Twenty’, (2018) 112 AJIL Unbound at 155–86. 68 Be it with respect to the Assembly of States Parties, the judiciary, the Office of the Prosecutor; defence counsel, or legal counsel for victims. See supra note 67. 69 Excluding Forewords, there were a total of 20 contributions to the three symposia; 14 from practitioners, six from scholars. 70 For an excellent treatment of this, see the article by Richard Clements in this issue of LJIL. Clements, R., ‘From Bureaucracy to Management: The International Criminal Court’s Internal Progress Narrative’, (2019) 32 LJIL doi: 10.1017/S092215651800064X. 71 Mégret, F., ‘International Criminal Justice: A Critical Research Agenda’, in Schwöbel, C. (ed. ), Critical Approaches to International Criminal Law (2014), at 46; see also Jacobs, supra note 5, at 2. 72 See Zweig, supra note 2, at 3.